Tamara Munzner poses with her award. 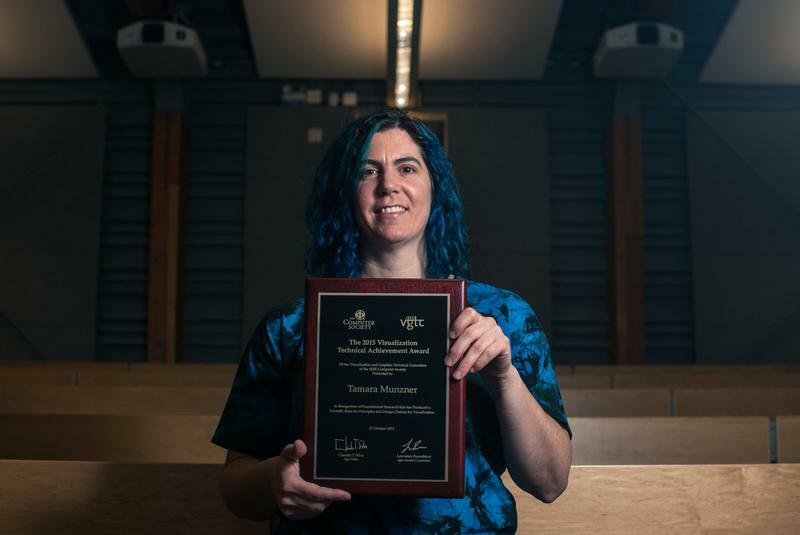 Tamara Munzner, a computer science professor at UBC, recently received the Visualization Technical Achievement Award for her 2014 book, Visualization Analysis and Design. Established in 2004, the Visualization Technical Achievement Award is issued by the IEEE Visualization and Graphics Technical Community to recognize researchers for achievements in the field of visualization. The process essentially involves interaction between the computer and the human brain to produce images, diagrams or animations. Networks and tables are two examples of visualization techniques. “It’s sort of a mixture of methods from computer graphics, human-computer interactions, cognitive psychology and algorithms…. It’s quite an interdisciplinary field,” said Munzner. Munzner also said that visualization is especially useful in representing information sets that are large in quantity or abstract. Thus, visualization techniques have a broad range of applications such as medical imaging, engineering or cartography to name a few. The aim of Munzner’s book is to organize knowledge about visualization in a coherent and structured way. “I tried to take everything that we learned in the field of visualization, which was very scattered … and try to come up with a framework for thinking about it systematically,” said Munzner. Munzner also said that since visualization is a relatively modern concept that emerged only during the 1980s, organizing the information in her book was challenging in some ways. Given that researchers across many academic disciplines make use of visualization techniques, Munzner also aimed to present the concept of visualization in a way that would be understandable. “I actually went to great lengths to not assume knowledge of programming or mathematics so that [the book] is accessible to people in other areas like geography and cartography,” said Munzner. Munzner is the first female recipient of the Visual Technical Achievement Award. She has been a professor at UBC since 2002, having previously worked as a research scientist at the Compaq Systems Research Centre.